The five star VP Plaza España Design located in the heart of Madrid in Plaza de España has created an exclusive three day VIP UEFA Champions League package to experience the Champion’s League final on 01 June 2019, combined with a stay in one of the city’s most exclusive suites, accompanied by a whole host of VIP experiences. The package has been touted as the most luxurious Champion’s League offer available (priced at €30,000 per night) and has been created for football aficionados that do not want to compromise on style or luxury. The experience includes two VIP tickets to the Champions League final, accommodation in the property’s 120m2 Presidential Suite located on the hotel’s top floor (17th story); offering a spectacular birdseye view of the city, luxury car transfers to the stadium, daily spa circuit and massage service, private guided tours of the Royal Palace and the Prado Museum, a personal butler service, and meals in the property’s 12th floor Ginkgo Restaurant & Sky Bar. Guests will also enjoy meals at Casa Lucio and the double Michelin star DStage restaurant, exclusive access to the post-match Champions League party hosted at Ginkgo Sky Bar on 01 June and many additional extras such as a daily bottle of premium champagne and an exquisite in-room breakfast. The UEFA Champions League is Europe’s most prestigious football competition where the biggest stars in football battle it out on the world stage. The Champions League Final will take place on 01 June at Estadio Metropolitano (Wanda Metropolitano), home of Atletico Madrid. 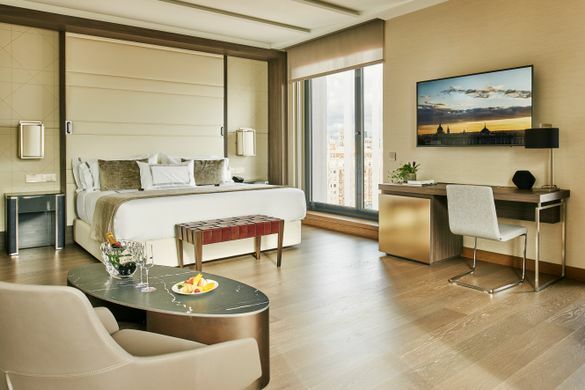 This exclusive three-day package promises an unforgettable stay in Madrid, combined with one of the most exciting sporting events of 2019. Package is priced at €30,000 per day (or €90,000 total) based on two people sharing, over a three night stay. Packages are also available in VP Plaza España Design’s 62m2 executive or romantic suites from €14,500 per day (or €43,500 total) based on two people sharing, over a three night stay. For more information or to book, please visit www.plazaespana-hotel.com/en/champions-league-hotels-accommodation or contact the reservations department reservasplaza@vphoteles.com / +34 91 595 55 10. VP Plaza España Design 5* is represented by LOTUS. For more information or for editorial enquiries, please email vp@wearelotus.co.uk or call 0207 953 7470.